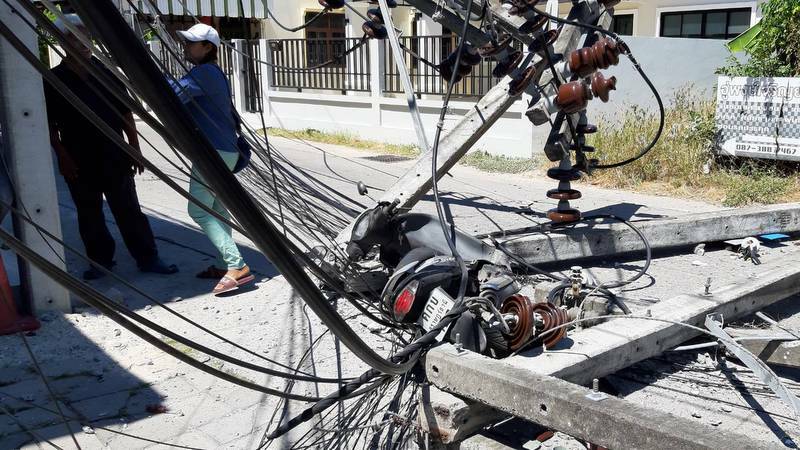 PHUKET: A Phuket expat escaped deadly injury today as he was struck by power cables that were pulled down by a cement truck in Chalong earlier today (Feb 8). The 10-wheeled truck pulled down four power poles, Soi Anusorn, off Patak Rd, in Moo 10, Chalong, just before 12:25pm. Telephone and internet cables were also pulled down in the accident, as were street signs and local council signs. A white Chevrolet sedan was also damaged in the incident. Local residents quickly assisted the foreign man to safety, He has suffered slight injuries to his shoulders, knees and limbs. Rescue workers provided first aid before taking to the Accident & Emergency Centre at the yet-to-open Chalong Hospital nearby for further treatment. Boonlert Phosri, 53, the driver of the CPAC cement truck, said that he had often drove down the street to avoid traffic jams at Chalong Underpass construction site. He had not encountered any problems before today. As soon as he realised what was happening, he stopped the truck in the middle of the road. Local residents said that earlier today they had noticed one cable that was hanging down lower that they had not noticed before. A high-roof pickup truck had nearly caught it in its roof, but smaller cars passed underneath without trouble and thought it was not dangerous, they said. Police at the scene said they had yet to conclude their investigation to determine the actual cause of the accident before pressing any charges against the relevant parties.